While security and innovation are top priorities for IT leaders, companies often overlook the importance of proper disaster recovery planning and testing. The importance of having a disaster recovery plan. 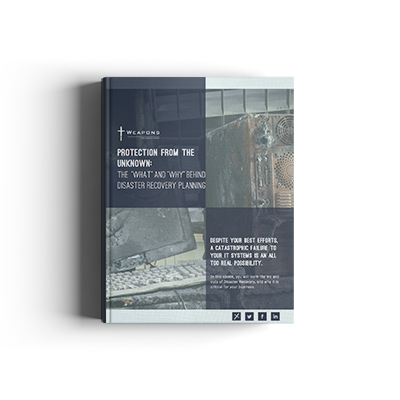 What you need to know about creating your own disaster recovery plan. IT Weapons, a Konica Minolta company, is a Canadian leader in secure cloud solutions and managed IT services. Trust IT Weapons to help you simplify technology and transform your business with premier security and compliance, and award winning client experience. Copyright 2019 IT Weapons. All Rights Reserved.